Well, if you haven't heard ...Lucy is having a rather unattractive party!!! In fact, it is downright FUGLY!!!! 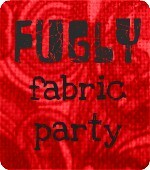 Post about it, link up and shake that ugly fugly fabric from your stash!!! Here is my contribution to the cause. I hate to say it is Fugly because it is someone's work and actually it is not hideous. I just know I won't use it. I have had it for several years and haven't even been tempted to cut into it even once. This is Targets by Kaffe Fasset....there is a full yard. And just to add a little sweetness to the pot....I am throwing in a charm pack of Etchings by 3 Sisters for Moda. There will be two opportunities to win this giveaway. I will randomly choose a winner on Monday Feb 13th. at 8:00 am. Please make sure I have your email....if you are a No-Reply Blogger I will need your email address within the comment. I'm a sucker for cute stuff such as Aneela Hoey and Heather Ross. I love anything by Kate Spain! I don't have a favorite fabric or designer. I like so many different fabrics, I am addicted to fabric. That's what got me into the Fugly rut I am in. Would love to win the etchings, tho. I am a follower of Molly Flanders. eu me tornei seguidora agora,isso vale? All time favorite? That is hard because I am constantly torn between loving Civil War prints and modern prints. CW would be Judie Rothermel and modern would be Kaffe. Really hard to decide who I like the best, so I will choose who comes to mind, Patty Young. Thanks for the giveaway. I like Kaffe, and I'd love to get some of that new fabric Malka Dubrawsky just released. thanks for the chance to win! I'm a follower too! thanks for another chance. I love Anna Maria Horned fabric - but I think Alexander Henry is great, too! I do Follow you, and I REALLY HOPE I WIN, because I have actually been searching for some of that Targets fabric to finish a project!!!! EEEKK! I need it! My favorite Fabric line of all time is probably Summer in the City by Urban Chicks. There are a few prints in that collection that I covet to this day. Thanks for hosting this giveaway! My favorite designer is Kate Spain, followed by Amy Butler. Love the fabric giveaway choices! Like most here, I like a lot of different designers. Right now I'm really loving Denyse Schmidt. Her new line for Joann's is beautiful. Thank you for the give away chance. Yes, i sure am a follower. Your work is beautiful! Oh Mary, what a cool fabric! I don´t have it although Kaffe Fassett is one of my favorite designers. On the other hand I love all the lovely 30s lines by Aunt Grace (Judie Rothermel), too. I am already a follower of your lovely blog! Amy Butler fabrics have always appealed to me! And I am a follower- but you already knew that!!! My all time favorite is Joel Dewberry's Heirloom collection! I follow your blog and love it!!!!! If I tell you that Target fabric is a great pattern for binding you wont want to give it away... And Etchings is the coolest range!! I've been strong in my resistance but if I was to win it, oohh happy me!! Okay you know the answer to the question, I'm the biggest Sis Boom fan!! It would be hard to pick a very favourite though I do love her Nuala pattern from her OOP Girlfriends range. I'm a loyal follower, There's always something fun happening over here!! I have a few, I love Fig Tree, 3 Sisters and French General..it depends on my mood which one I quilt with. Thanks for the giveaway. I just love everything Amy Butler designs! I'm a bit new in fabric land, so many designers to discover! I'm a fond follower! Love your blog! Thanks for al the inspiration. I still really love Wild Thyme by Carolyn Gavin. My favorite designers have been the Me and my sister (sisters i think) that i have been in love with for the past 2 years. I guess I have been loving the bright colors. Im favouring Riley Blake - at the moment lol! I am a new and pleased follower! I'm a sucker for anything Joel Dewberry, Jenean Morrison, Amy Butler....I think my all time favorite though would be Jenean Morrison. My favorite is probably Kate Spain though I love Heather Ross too. Thanks for the giveaway! Right now I'm in love with Lori Holt's "Sew Cherry" line....making hexagons!!! I love Michael Miller dots, in fact love all dots and stripes! Also Riley Blake, Kaffe Fassett, Amy Butler. And I'm a follower of your Blog. So many inspirational ideas, they make me drool! So, hope I'm a winner! I am a Heather Ross fan. Love her stuff. I also made a quilt for my brother with Etchings for Christmas and bought the fabric thinking it was so not me - then fell in love with it while I sewed. I would happily give your fabric a new home! what a fun giveaway... I made a quilt using Wiscasset range.... I keep looking at it and wish I had more... old fashioned me!! I would have to say that Sweetwater is my favorite designer right now. Thanks for the great giveaway!! I love Ruby by Bonnie and Camille! I have to say I've always been a fan of Martha Negley's fruit prints. Oh, and I follow via email! Kaffee is my favorite fabric designer. I really like the Kaffee fabric and the prints! I am a loyal follower of Mary the queen of hand quilting!! And her cute socks! I soo luv Tula Pink!! !Thanks for the giveaway! i am a follower and have been for awhile-luv your blog!!! Love your blog! I am a faithful follower! I'm a big fan of Innocent Crush by Anna Marie Horner, and have loved everything Heather Ross has done. Thanks for the giveaway - love this idea! My fav line is Sandi Henderson's Meadowsweet. I love it! I'm a follower in my google reader - love your work! Oooh.. I have lots of favorites. Right now I really love Sarah Jane's Children at Play line.. so cute! And I follow your blog on googlereader! I love Kaffe the most for color saturation and big loud prints! I do like other designers as well like Philip Jacobs, Amy Butler, Valorie Wells just to name a few. I love coming here for all the inspiration. I love that you use color and are not afraid to use it. I also like that you do a lot of EPP which I have started doing as well. I think my all time favorite fabric is the Bliss line, or pretty much anything from Bonnie and Camille. All-time favorite line? Do i really have to pick? Oh, ummmm, um, uh, ok, designer then ... But it's not really just one - but jst about any Alexander Henry print from the '90s. And i've been follwing your blg for awhile now. I love etchings... the targets I'm not so sure about, but it's not terrible. Currently, I am in love with Primitiva. I also happen to really like Kaffe's Target. favorite line would be heirloom by Joel Dewberry. Thanks for the giveaway! My favorite designer right now is Me and My Sister. Laying under a quilt of their fabric (Happy) right now. oh, I'd love to give the 'target' print a good home! My favorite collection is 'meadowsweet' Thank you for the giveaway! My favorite has always been Kaffe Fassett's Roman Glass line. I'm a real Kate Spain fan. I'll bet I could find a fun use even for the Target. I have several fabrics in those colors and I can see a really fun, oceanie calming quilt there. Thanks. I'd still like to get some Sunkissed by Sweetwater! I really like anything in blue (even your fugly fabric! ), but mostly anything Japanese and cute. If you put eyes and a mouth on any inanimate object, I'm a fan! I would love to give your fuglies a new home. My all time fave is Authentic. I am a huge fan of everything Sweetwater does. I am subscribed to your blog in Reader. I guess that makes me a Follower. I think my all time fave is a tie between Ruby and Bliss. Love both of those! At this moment my favorite line is Redwork Renaissance...love it! Your fuglies would be most welcome in my home..thanks for the chance! My favorite designer... hmm, a toss-up between AMH and Kaffe Fassett. And most stuff that Marimekko puts out, too. I loves Ann Kelle's Urban Zoologies.. Cute..
My favorite line right now is Kate Spain's Terrain. I love the new malka dubrawsky line!! oh I actually love the targets, I love Denyse Schmidt fabrics too, actually probably easier to list ones I don't love lol. I am in love with Melody Miller - she is the antidote to fugly! i always hate the question of favorites--book, author, song, movie . . . whatever. each item i love fits a particular need/desire. that said, your blog is my favorite! ;-) and i have discovered many new designers/lines reading through these comments, which is AWESOME! I LOVE Flea Market Fancy and pretty much any print produced by Aneela Hooey--so so cute! I am officially a follower as well! I love the line of fabric Summerhouse by Moda. Have lots of it and haven't even cut into it yet. I am a loyal follower and actually love both of the items in the giveaway! thanks for the chance. I stopped by to tell you that I have been feverishly working on that string quilt block you showed. I love it. I want to thank you for the inspiration. Then I see you are having a giveaway with fabric from my favorite designer. Yes- he totally is my favorite. Him and Kate Spain. Count me in! I'm a Faffe and Amy lover! Love the targets! I'm a flower - oops follower. Hmmm. My favorite designer is Kathy at Material Obsession. My favorite fabric line is Kaffe Fasset. I am a total fan of Molly Flanders. Although I have many blogs in my Favorites folder, I only look at about 5 regularly. Molly Flanders is one that I look at daily. Love your work and your postings. They get me through each day. My favorite line was probably Anna Maria Horner's Good Folks. But I like most of what Ann Kelle designs, too. My all time fav fabric designer: 3 Sisters! Seriously! I'd LOVE to win that fabric! (And my mom LOVES Kaffe!) Thanks! I'm a big fat follower of Molly Flanders! Thanks for the chance! My favorite fabric line of all time...wow, that's a toughie. I have to say Joel Dewberry's Modern Meadow. what happens if I don't have an all time favourite? I wonder if you can have an all time favourite when you still have more than 40 years until retirement ahead of you .. seems like an awfull lot of time to stick to one. I love polka dots, green polka dots - is there a line with them? dots... i can't get enough of them. and... hope valley. i never tire of it. I am new to quilting and sewing and have a lot of fabrics that I love, but Sweetwater and the Hometown line are my current favorites! And I'm also a follower! yay! I think I really love Heather Bailey prints...and also enjoying a few Riley Blake lines...and Bliss is gorgeous and Ruby. Yeah, I like fabric. =) Thanks for a chance to win. Wow, love those text prints. My favourite fabric line at the moment is either Brown Stone by Timeless Treasures, or Just Color from Studio E.
Lol! I actually love that fabric or anything by Kaffe for that matter. But I agree that I find it hard to quilt with his fabrics. I like them more for clothes or pillows. I'm not really sure I have a favorite fabric line, though I've been loving Denyse's picnic and fairgrounds. I LOVE Anna Maria Horner, especially her loulouthi flannel and velveteen. Yummm! I love sweetwater. I've been mashing up Lizzy House with Anna Maria Horner. If I could choose a favorite my stash might be manageable! I love everything by Kaffe Fassett. Thank you for your generous offering. my favorite designer would either have to be sandy gervais or basicgrey or sweetwater goodness how hard to choose. i am a follower of your blog. This is what made me want to try hand quilting! I am a fairly new follower of your blog and I really enjoy it. I LOVE Kate Spain's designs. :) Thanks for the giveaway! New to quilting so just material is my favorite. One of my favourite lines is Sandi Henderson's Farmer's Market. I'm a new Molly Flanders follower! I like Kate Spain's fabrics. Thanks for the chance to win! Yes, I am a Follower of your delightful Blog. My favorite designer is Kaffe Fassett! His prints look so rich and over-the-top when used together. I love Heather Ross. Great prints! Thanks for the giveaway! There you see, other's fugly is other's favourite! I thought to look first if your lovely give away is international and saw your question about favourite designer - one of my 'always favourites' is Kaffe Fasset and I would love to win that blue fabric! Also blue is my favourite colour! I'm also fan of writing and buildings on fabrics! I'm happy your happy follower! I'm a Kaffe freak, not that I've got much of his, but the line of fabric I adore with a passion is Oakshott Solids. Truly truly lucious. I love Kaffe Fasset's fabrics. Thanks for the great giveaway! I don't really have a favourite fabric line, I just love that there are so many wonderful fabrics out there to choose from! I love Michael Miller fabrics! 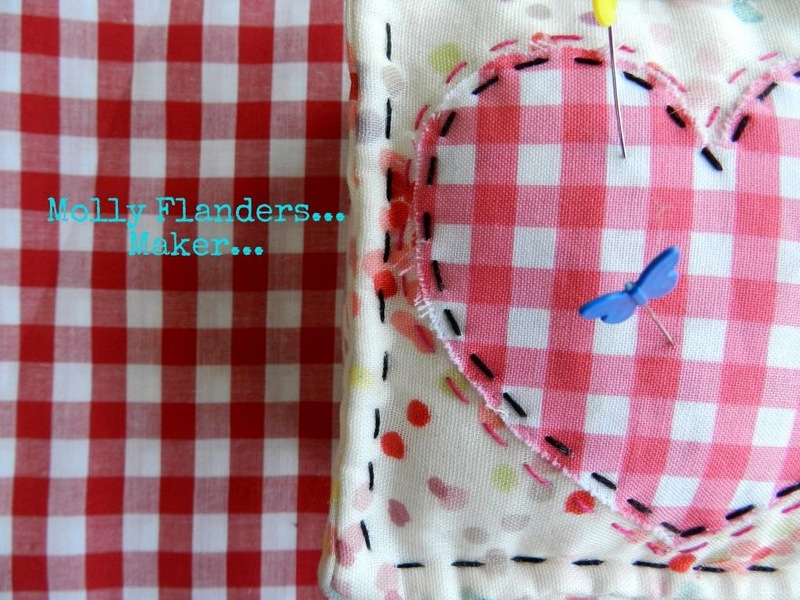 I am a follower of Molly Flanders' blog and love seeing all of Mary's beautiful work! Easy choice for all time favorite fabric: Habitat by Jay McCarroll.